In many parts of the United States, alfalfa is cut three to five times per year for three to five years; then the stand begins to lose productivity and it is rotated to another crop. Research has shown that alfalfa yield decline hits about 25 percent during the fourth production year (fourth year after seeding). For operations that only want to intensively manage and feed pure alfalfa, three- to four-year rotations generally make good economic sense. “As an alfalfa stand begins to thin, consider interseeding grasses into it,” says Bruce Anderson, extension forage agronomist with the University of Nebraska. “Not only might you extend the useful life of your alfalfa field by several years, you will develop an excellent hay or grazing source for livestock,” he adds in a recent edition of Nebraska’s CropWatch newsletter. In his area, Anderson recommends seeding cool-season grasses into thinning alfalfa fields from mid-August to early September if soil moisture is adequate. It’s during this time that alfalfa growth is slowing, which provides less competition for the grass seedlings, and temperatures are beginning to moderate. Anderson says that if the alfalfa develops a full canopy later this fall, another cutting may be needed to allow sunlight to reach the developing grass seedlings. 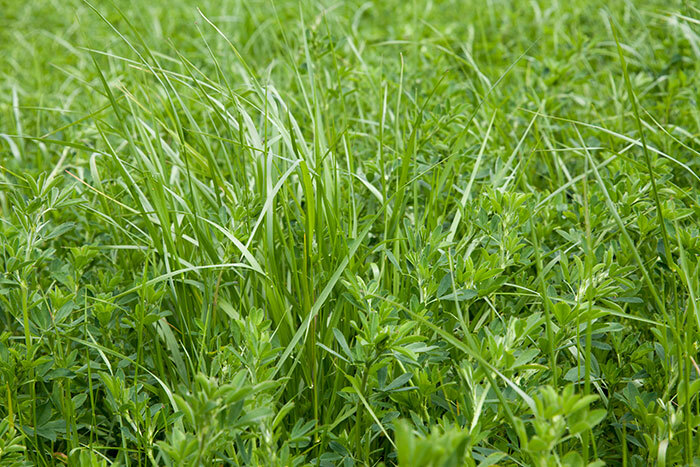 Orchardgrass is often the grass of choice when interseeding into alfalfa, but Anderson also suggests species such as novel endophyte tall fescue, meadow bromegrass, and festulolium. A mixture of grasses is also an option if the field will be used as pasture and you desire a diverse mix. In my travels over the past couple of years, I have seen this practice put into place on two farms as a foundational strategy for extending the useful life of an alfalfa stand. Each farm, however, had very different end games. The alfalfa-based forage system perfected at Hedgeapple Farm has resulted in the ability to produce carcasses routinely grading Choice in 22 to 23 months for steers and 18 to 20 months for heifers. Alfalfa may come to the dance alone, but there is opportunity to find it a dance partner in the form of a cool-season grass and keep fields producing for an extended time.